Come take a look at this private mountain getaway nestled amongst the pines. With beauty, wildlife and serenity, this home with acreage is full-time Colorado living at its finest. Once you enter the home you will be delighted to see an open floor plan featuring a beautiful stone fireplace, as well as a cozy living room, perfect for curling up with a book. With 5 bedrooms and 3 bathrooms, there is more than enough room for everyone! A spacious master bedroom with high ceilings & private balcony & spa-worthy bath creates a peaceful space to relax. 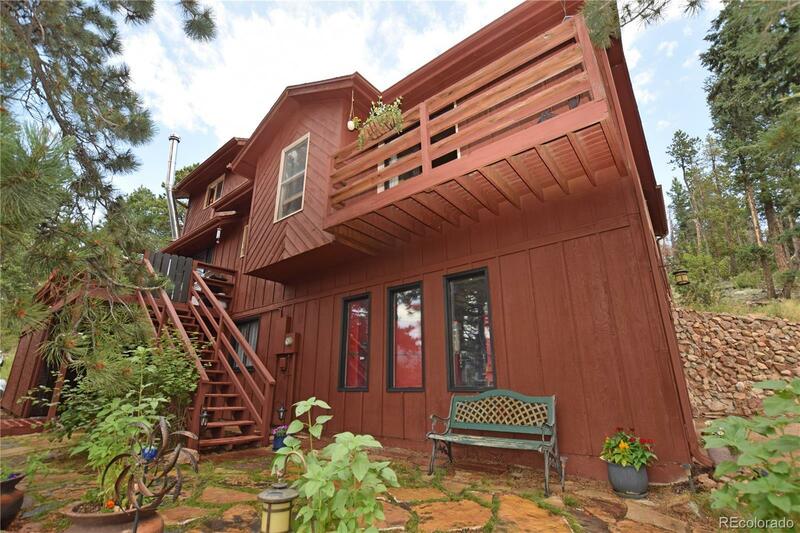 Take your choice of amazing decks to enjoy your morning coffee, while admiring panoramic views of the front range. The finished walk-out basement space can easily be converted into a mother-in-law suite or AirBnb unit by converting flex space into a kitchenette. This is the home you've been waiting for!